The Chateau Cotbed is part of a beautiful well finished neat nursery range. This Cotbed converts into a toddler bed. This is a clean white colour. If you are limited with your space and are looking for a neat cotbed this is the one for your nursery. There is 3 levels to adjust the mattress on this cotbed. All of our products are sourced with practicality in mind and this cotbed is practical, stylish and value for money as it will see your child make its way from a cot into its first little bed. The Chateau Cotbed is part of a beautiful well finished neat nursery range. This Cotbed converts into a toddler bed. 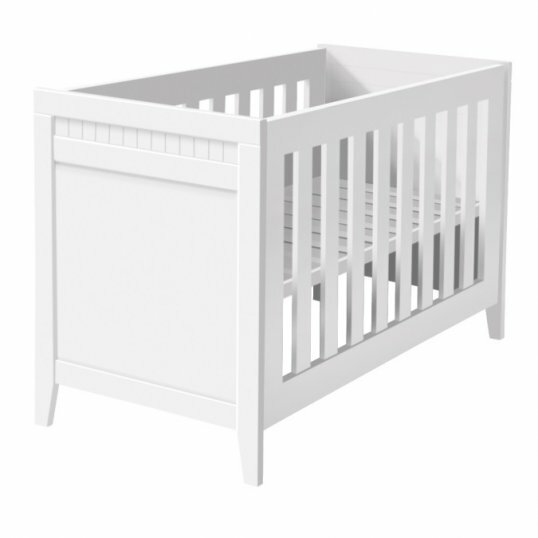 This is a clean white colour.If you are limited with your space and are looking for a neat cotbed this is the one for your nursery. There is 3 levels to adjust the mattress on this cotbed. All of our products are sourced with practicality in mind and this cotbed is practical, stylish and value for money as it will see your child make its way from a cot into its first little bed.